GC America’s Kalore Composite….Try it for Free!!! 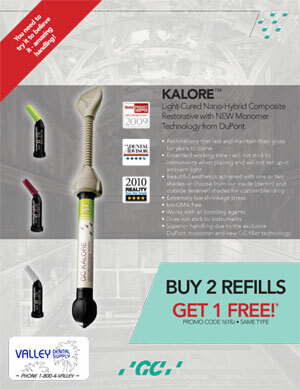 Through the end of 2011, Valley Dental Supply is promoting GC America’s Kalore Light Cured Nano-Hybrid Composite. We are offering a Buy 2 Refills, Get 1 Refill Free. We are also offering a free sample (compules only) to try (U.S. Addresses only) . To get a free sample, send an email to valleydentalsupply2@gmail.com and include your name, address and the name of the composite you are currently using. You may also send us a DM on twitter or Facebook as well. We will get the sample out to you ASAP.